Published By – Happy Face Music Ltd.
Discs 1 & 2 and "Lords Of Summer" recorded and mixed May 2015 - August 2016. "Ronnie Rising Medley" recorded March 2012, released in 2014 on the "Ronnie James Dio - This Is Your Life" album. All songs originally released by Rainbow in 1976 on the "Rising" album except "Kill The King", originally released by Rainbow in 1977 on the "On Stage" album. "When A Blind Man Cries" recorded & mixed 2012. Released in 2012 on the "Re-Machined: A Tribute To Deep Purple's Machine Head" album. Originally released by Deep Purple in 1972 as the B-Side of the "Never Before" single. "Remember Tomorrow" recorded May 2008. Released in 2008 on the "Maiden Heaven - A Tribute To Iron Maiden" album. Originally released by Iron Maiden in 1980 on the "Iron Maiden" album. "Helpless" released in 1987 on the "$5.98 E.P. - Garage Days Re-Revisted". Originally released by Diamond Head in 1980 on the "Lightning For Nations" album. Barcode (Printed): 6 02557 15631 7 ? Hmmm so they felt the need to include a new garage days re-re-re-re visited and a live album of classic tracks. 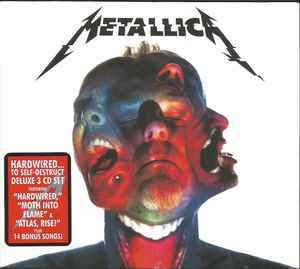 Have Metallica ever released a proper live album? I don't think so.